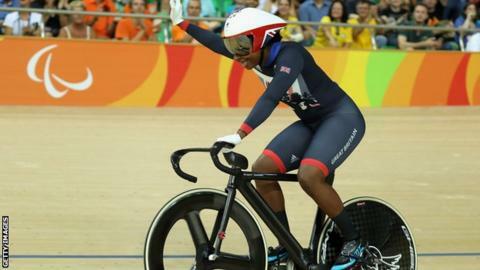 Paralympic champion Kadeena Cox will return to top-class action at next month's UCI Para-cycling Track World Championships in the Netherlands. Cox, who won cycling and athletics golds at Rio 2016, suffered a knee injury in December 2017. The 27-year-old returned to the saddle in December's Track World Cup in London where she beat 14-time Paralympic champion Sarah Storey. Storey will also compete at the event in Apeldoorn from 14-17 March. It is the first Track Worlds for the 41-year-old since she gave birth to her second child Charlie in October 2017. She was selected for last year's event in Brazil but withdrew after an outbreak of yellow fever in the country. Defending world champions Jody Cundy, Katie Toft, Megan Giglia, Crystal Lane-Wright, Louis Rolfe, Jon-Allan Butterworth are named in the 25-strong squad. They will be joined by tandem pairs Neil Fachie and Matt Rotherham, Lora Fachie and Corrine Hall, Sophie Thornhill and Helen Scott, and Steve Bate and Adam Duggleby, who will also be defending their rainbow jerseys. There is also a call-up for George Peasgood, who is part of the British Para-triathlon squad and competed in the sport at Rio 2016.